10 April 2013Satellite engineers learn to get used to the weirdly hushed interior of the Compact Payload Test Range in ESA’s ESTEC technical centre area, in Noordwijk, the Netherlands. 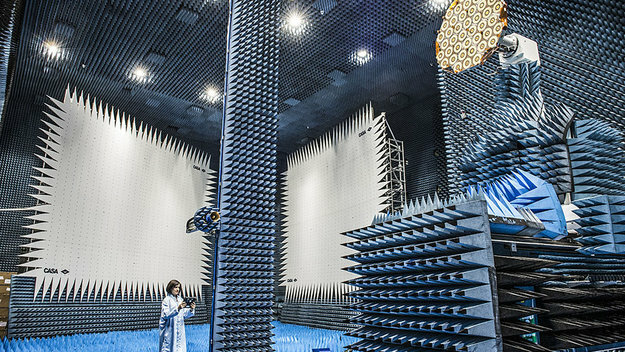 In this zone of silence, satellite antennas are tested ahead of launch.Metal walls form a ‘Faraday cage’ to block all external signals, isolating the facility from TV and radio broadcasts, aircraft and ship radars, and even mobile calls. Spiky foam cladding absorbs radio signals internally to create conditions simulating the infinite void of space.Modern antennas are extremely complex, often transmitting highly shaped or multiple pencil beams rather than a single main beam. They must operate efficiently and be aligned to keep space missions connected with their home world, while being sensitive only to a carefully prescribed frequency range – and all this needs thorough testing on the ground. The white surfaces in front of the ‘anechoic’ blue background are reflectors that pass signals from an illuminating antenna to the antenna under test. The reflectors transform the spherical expanding rays of the illuminator into a straight signal beam as if the illuminator were located far away in space. To increase its capabilities, the Compact Payload Test Range (CPTR) was recently equipped with a state-of-the-art Near-Field Scanner (NFS) to measure the electromagnetic fields closely surrounding a test antenna. Via mathematics, the equivalent radiation at large distances is calculated. This new set-up and test technique allow the measurement of larger antennas (up to 8 m in diameter) over a larger frequency range (0.4–50 GHz). Its first assignment will be to characterise the radiated performance of the next Galileo satellites ahead of their launch later this year. Inside ESTEC’s Test Centre, the hybrid CPTR/NFS is equipped to test large antennas or complete satellites in cleanroom conditions. Its smaller Laboratory counterpart, the Compact Antenna Test Range, is also available to test smaller antennas quickly and easily in standard ‘ambient’ conditions.